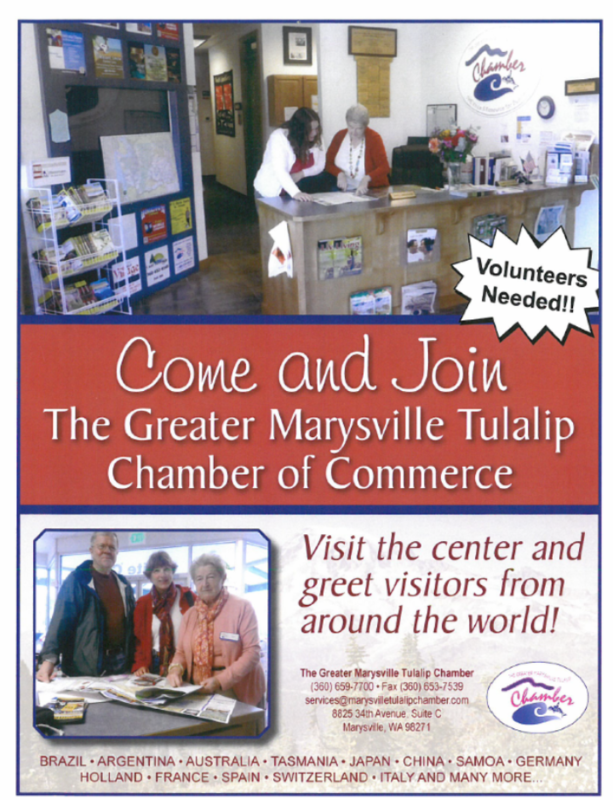 The Greater Marysville Tulalip Chamber of Commerce's Regional Visitor Information Center is dedicated to supporting and expanding our area's tourism industry by promoting area businesses and attractions. Located just off of Exit 200 in Tulalip's Quil Ceda Village, we serve area residents and businesses as well as a myriad of visitors from throughout the county, state, region, nation and WORLD. We actively maintain hundreds of resources that assist us in responding to the over 5,400 individuals who walk through our doors each year, as well as in answering the thousands of phone calls, and e-mail requests we receive annually. Our Center is open Monday through Friday year round and features free Wi-Fi service that is advertised on I-5 with our Department of Transportation signage. Our VIC is staffed by a dedicated professional group of volunteers that we recruit and train. This group is complemented by Services Alternative, Housing Hope and Goodwill interns who we train in customer service, office procedures, telephone reception, computer skills and more. Our volunteer personnel is recognized annually by the White House with individual US Presidential Service Awards based on their annual hours of service. We keep statistics on our visitors that help guide area businesses in marketing emphasis, and assist greatly in recruiting new businesses. These statistics include, but are not limited to “Origin of Visitors”, “Visitor Volumes” and “Visitor Information Requests by Category”.